Guest Post - Summer Cooking: What’s in Season Now! ~ Diane's Vintage Zest! Guest Post - Summer Cooking: What’s in Season Now! Here is a great guest post from Meredith K. who is going to share some great seasonal cooking tips for the summer as well as an amazing recipe for Pan-Grilled Veggie Pasta Primavera. How apropos, considering yesterday's post on my mom's productive veggie garden! Read on for the details! Summer is all about sunshine and being outside, and with gorgeous weather comes something just as exciting: gorgeous seasonal produce. So many fruits and vegetables come into season during the summer that it only makes sense to take advantage and go crazy in the kitchen with them. If you’re overwhelmed by your summer cooking options, try getting started with this list of seasonal summer fruits—you’ll have plenty of options to choose from! If you’re looking for a healthy snack this summer, slicing up a pepper and dipping it in hummus or ranch is a great option. Red, orange, yellow and green peppers are a fantastic way to brighten up any dish and can add a spicy kick to everything from sandwiches and burgers to casseroles and dips. Tomatoes are one of the most versatile fruits out there and are especially good during the summer season. 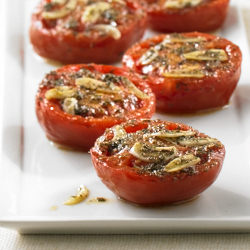 Tomatoes are best known for their contributions to sauces and salads, but other popular summer tomato recipes include caprese salad, fresh salsa and chilled gazpacho. 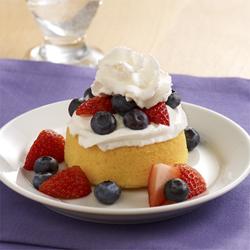 While you probably consumed an abundance of cherry and blueberry desserts over the Fourth of July weekend, these fruits are good for more than just their patriotic colors! Many berries come into season during the summer, meaning you shouldn’t hesitate to start baking cobblers, pies, tarts and crumbles galore. Summer squash and zucchini are two vegetables that are much more prominent during the summer months than any other time of year. Grilled squash and zucchini make healthier side dishes than chips or fries, and they’re also delicious roasted, sautéed or even eaten uncooked in salads. 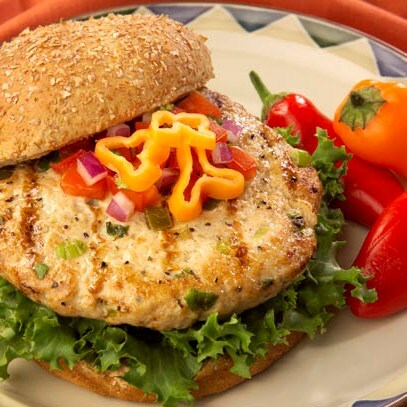 Try stuffing either veggie with ground turkey and cheese for a light but hearty summer dinner. 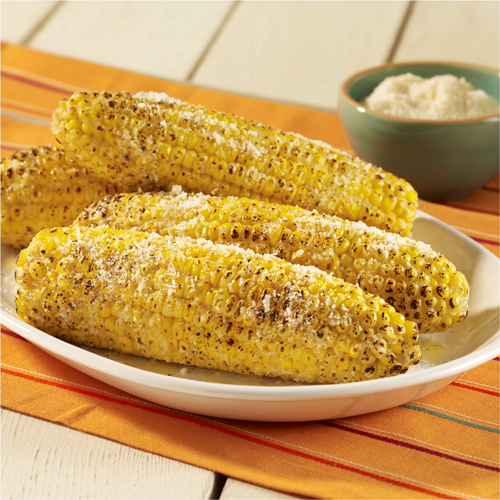 Nothing’s more summery than corn on the cob hot off the grill and slathered in butter, spices or parmesan cheese. It’s amazing eaten by itself alongside burgers or hot dogs, but don’t be afraid to incorporate it into fruit or vegetable salads, egg dishes or even baked goods. This easy recipe for pan-grilled veggie pasta primavera is a great way to use up any fresh summer squash, zucchini, peppers and juicy tomatoes that might be littering your kitchen counter right about now. It’s a lighter, summery alternative to those heavy easy lasagna recipes you probably ate all winter long, but just as delicious! Prepare pasta according to package directions; drain and keep warm in the cooking pan. Combine zucchini, yellow squash, bell pepper and onion in a large bowl. Spray with cooking spray and toss to coat. Sprinkle with oregano, salt and black pepper; toss again. Heat a large grill pan or skillet over high heat. 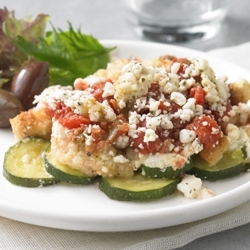 Add vegetables and cook until they are crisp-tender, stirring frequently. Remove vegetables from pan and cover to keep warm. (Alternatively, you can grill vegetables in a grill basket until crisp-tender and slightly charred, stirring frequently). Add undrained tomatoes and vegetables to pasta; toss well until mixed. Sprinkle with cheese and serve warm. Author Bio: This is a guest post by Meredith K. on behalf of Hunt’s®. 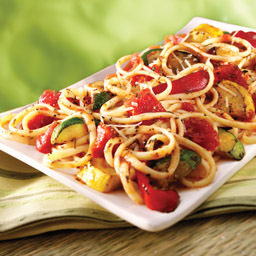 For more summer pasta recipes, from cool pasta salads to easy meatloaf recipes, visit www.hunts.com.